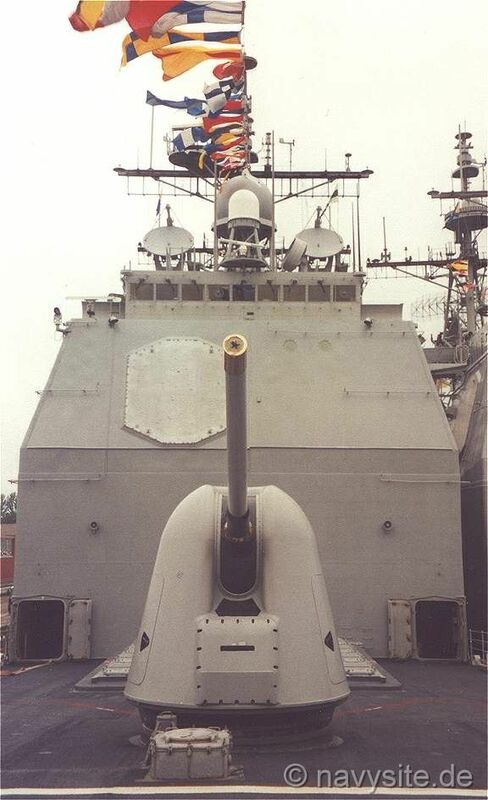 The Mk 45 lightweight gun is a fully automated gun installed aboard CGs, DDs, DDGs, and LHAs and the gun is used against fast, highly maneuverable surface targets, air threats and shore targets during amphibious operations. 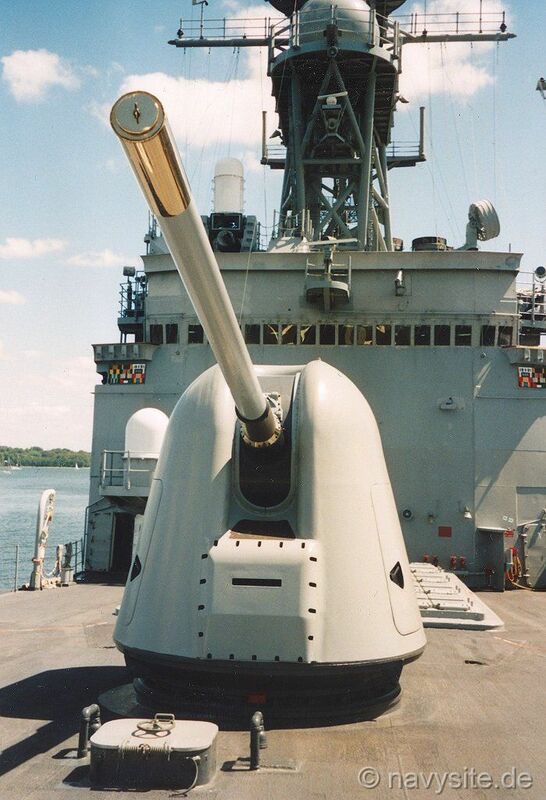 The Mk-45 gun system offers significant improvements in reliability and maintainability over the previous 5"/54 (12.7 cm) caliber Mark 42 gun systems. It is claimed that this is the lightest 5-in (12.7 cm) mount in the world, however, it is also one of the slowest firing. The gun-house is watertight and has zone-temperature controlled de-icing of the gunport. The Mod 1 version incorporates a major improvement in that it can select and fire six different kinds of ammunition at the push of a button, thus increasing the speed at which it can respond to changing threats. 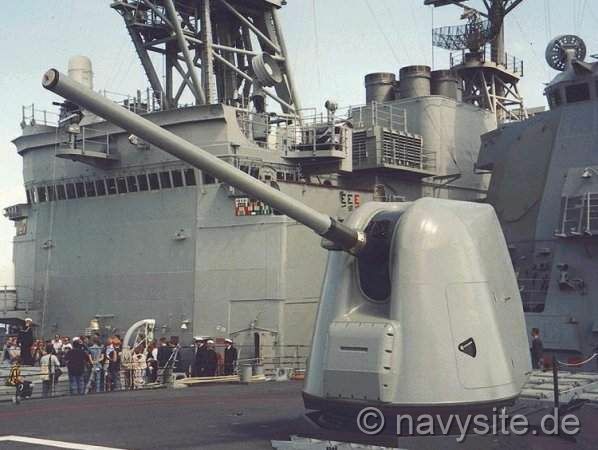 The Mk-45 was designed as lightweight gun with a weight of only 22 tons. This was only possible by reducing the penetration, the range, and the number of rounds a minute. 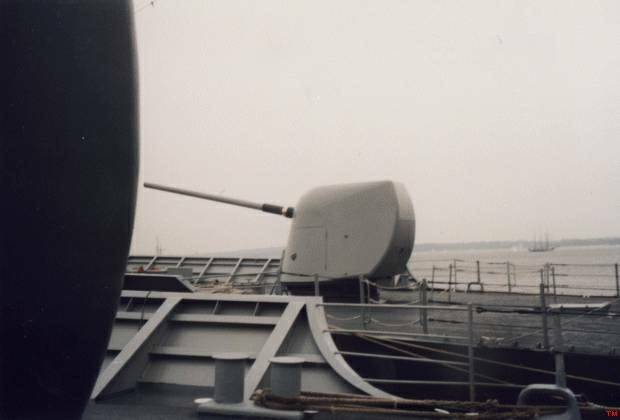 (Compared to the Mk 42 gun). Fully automated, there is only one person necessary to operate this gun and the mount is unmanned. The whole gun crew consists of 6 people. Each mount has its own magazine with approx. 600 rounds in it and the Mk 45 is controlled by either the Mk 86 Gun Fire Control System or the Mk 160 Gun Computing System. Primary Function: Fully-automatic, lightweight gun mount. Magazine Capacity: 475-600 rounds per magazine. Back. Back to Weapons List. Back to first Page.